Teenmentalhealth.org is working to change the conversation surrounding mental health and mental illness in Canada by taking awareness one step further to literacy. 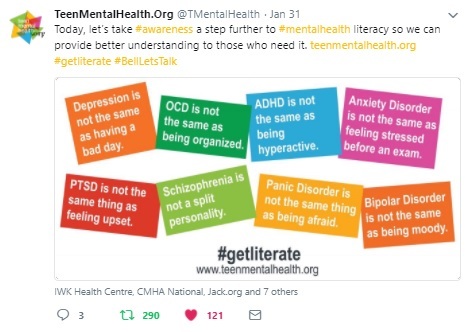 In January 2018, we developed a creative concept to promote mental health literacy ahead of Bell Let’s Talk Day (January 31st) called #getliterate. This campaign had both online and print components involved, with a major focus being placed upon the organization’s social media channels. The final deliverables for this campaign included a set of eight online cards highlighting eight mental illnesses, campaign cover photos for Facebook and Twitter, a website banner, a social media content calendar for the organizations use, a social media content calendar for partner use, a Facebook Live session with Dr. Stan Kutcher and a mental health literacy poster for external distribution. Between January 23rd and February 2nd, Teenmentalhealth.org’s social media channels – Facebook and Twitter – gained considerable reach numbers, with Facebook seeing a total reach of 36,305 and Twitter seeing a total reach of 137,386. Campaign engagement rates were also significant during this period, resulting in 2,751 likes, comments and shares on Facebook (for an overall engagement rate of 7.58%) and 3,503 likes, comments or retweets on Twitter (for an overall engagement rate of 2.55%). 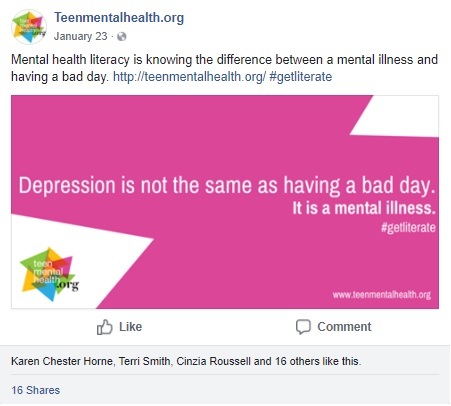 Based on the success of this campaign, Teenmentalhealth.org have decided to move forward to a national commercial sponsorship buy through Cineplex, as well as a considerable online investment to promote the #getliterate campaign through use of Facebook Ads. By extending the campaign to a national level, Teenmentalhealth.org plans to leverage the importance of mental health literacy across Canada.